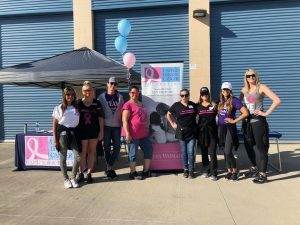 United Breast Cancer Foundation, located in Huntington Station, NY, is a national nonprofit that began as a small grassroots organization serving low-income, under- and non-insured women and men in New York State area. We currently serve women, men and their families across the country offering breast health and wellness services focused on cancer prevention, screening, treatment and overall wellness. UBCF is committed to helping those in need of breast health services with education, treatments and connection. United Breast Cancer Foundation brought the holiday spirit to Nashville‘s breast cancer community in December at our final event of the year with apparel items for survivors. Thanks to Good360, we gifted over 200 clients pink bags full of beautiful clothing from clothing donors for women in need of new clothes. Along with the clothing donation we also gifted water filters, beauty products, reading glasses, and cowboy boots giving the women new outfits for the new year. Here at UBCF, we truly know how important peace of mind is, especially for breast cancer patients and survivors. Without a peaceful night’s sleep everything else falls apart, and the strain of treatment can cause more havoc to our survivors. One of our clients told us how truly grateful she was for our donations and how much they meant to her. She shared with us that she and her children were effectively homeless, and had nothing after recently being abandoned by her husband. She was thrilled to receive the clothing and other items UBCF gifted to her and her family! Thank you Good360 for providing the self-confidence these survivors needed after stressful times.